The Fed Minutes from its meetings on May 1st and 2nd were very interesting possibly because Fed chair Powell is still new and the Fed is absorbing new officials into the fold this year. The outlook of the Fed was altered to the dovish side which is surprising considering the fact that it is in a hike cycle and the economic data has mostly reflected an improvement in the economy. The CNBC GDP tracker expects Q2 GDP growth to be 3.5% as of May 23rd. We are still early in the quarter, but the results look good. To be clear, the data the Fed had a few weeks prior was less complete, but there was similar optimism about Q2 as there were signs of improvement. The Fed’s two mandates are stable prices and maximum employment. With the past few years showing improvement in the prime age labor force participation rate, the goal of reaching maximum employment is winding to a close. We are the point in the cycle where the Fed usually cares more about inflation than supporting the labor market. That worries risk assets as the Fed could raise rates quickly even though it hasn’t in this cycle. In fact, this rate hike cycle has been the slowest since 1977, yet the rhetoric has been the most hawkish since 2006. The market also has the Fed’s balance sheet unwind to worry about, so it might be more sensitive to rate hikes than it would otherwise be. 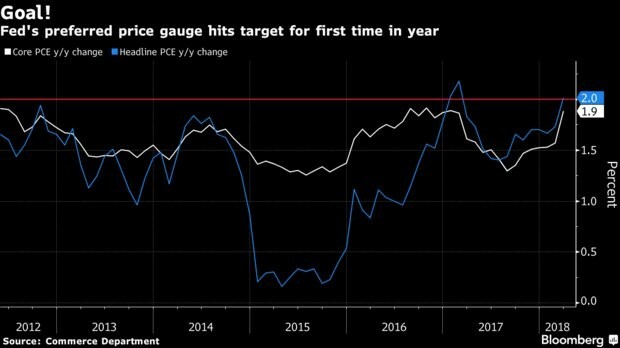 The Bloomberg chart below, which shows inflation coming close to the Fed’s target of 2%, perfectly sets up the discussion in the Minutes. The Fed policy term which best summarizes the Minutes is “symmetric.” The term was used 11 times in the report. The concept of symmetry is that since inflation has been below the 2% goal for so long, as you can see in the above chart, the Fed should allow the inflation to stay above 2% for a similar amount of time (as we discussed previously). This is a new thought process by the Fed which is always tinkering with policy. The Fed can’t come up with rules that are too stringent because there are always new unforeseen situations. Forgetting about the monetary policy aspect and just looking at the logic of the policy, it makes little sense to aggressively hike rates after the inflation rate gets above the target if that’s a long run goal because it has been below the target for so long. The Fed doesn’t look at just this year when making policy; clearly, hitting 2% for a year doesn’t mean that has been the average inflation rate this cycle. The Fed should be looking at America’s demographics and the inflation rates of the other advanced economies because they indicate inflation won’t be getting much higher, assuming all else being equal. Europe is grappling with declining inflation which never hit its 2% target even though it has easy policy still going. Their monetary policy normalization is way behind that of the US. 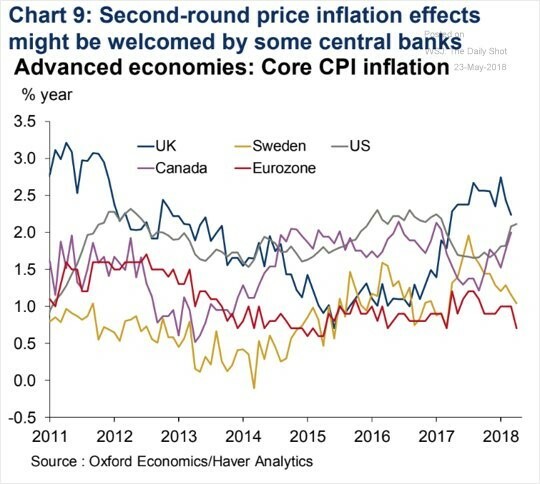 The chart below from the Daily Shot shows US core CPI is ahead of Canada, the E.U., and Sweden. This means the Fed should be counting its blessings; it should support economic growth instead of trying to slow it. America hasn’t had many periods of strong GDP growth in this expansion and wage growth hasn’t been meeting expectations. Therefore, the Fed won’t slam on the breaks through accelerated rate hikes just because inflation is just below its target and is about to get slightly above it. The Fed has prepared for higher inflation with its rate hikes which started in December 2015 when inflation was much lower. Even though the Fed is now tempering rate hikes, there was a discussion about changing the boilerplate memo after the FOMC statements which states that the Fed is accommodative and will have rates below long run rates. That’s more of an adjustment based on what has been done, than a change in guidance. 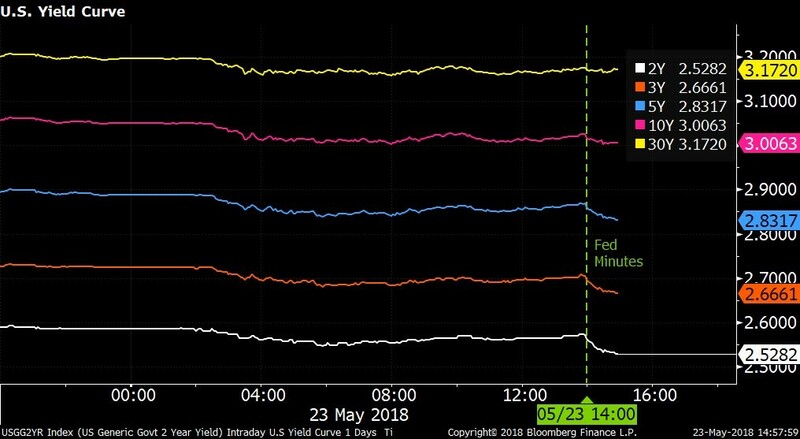 The Bloomberg chart below shows the decline in the bond yields, particularly in the closer maturity dates bonds, after the Fed Minutes were released. The decline in the 2 year yield shows you the Fed was dovish. Regardless of these near term changes, the yield curve has been flattening to the point of concern this year as the difference between the 10 year yield and the 2 year yield is 47 basis points. A few more hikes along with hawkish guidance from the Fed could invert the yield curve. This possibility adds fuel to the fire of the Fed’s policy of letting inflation run a bit above the 2% target. The Fed discussed the possibility that its balance sheet and the actions of other central banks could render the indicator useless, but ultimately policy makers surmised that the curve is important because of its great track record of predicting recessions. The Fed could consider altering policy further in the next few months if the curve flattens more. Members debated the idea that the Fed is near the end of its rate hike policy. This isn’t a shock because of where the economy is in the cycle. This is an early warning sign that 2019 could be the last year of rate hikes. Usually the end of rate hikes is an early warning sign of a recession. Will a recession be delayed if the Fed makes a concerted effort to avoid inverting the curve? One odd part of the Minutes was that the Fed determined the interest rate on excess reserves was at the high end of its target range so in the next rate hike, it will hike the IOER by 20 basis points instead of 25 basis points. 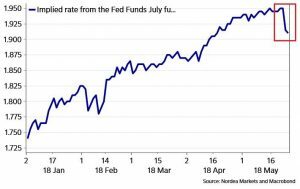 The effective Fed funds rate is going to be lower within the target range, so the rate hike chances for June fell even though the Fed stated it would hike rates in June. The Macrobond chart below shows the implied rate based on the Fed funds futures fell 4 basis points. This change in policy is not a big deal, but it’s worth mentioning because it’s relatively unique and affects how the percentages of rate hikes look. The Fed being more dovish is good for stocks and bonds, and bad for the dollar. The dollar was actually up on the day of this announcement, but that’s because it was up prior to it; there was a slight decline in the afternoon. If the Fed were to hike rates 4 times in 2018, it would push a recession closer. Since the Fed has recognized it isn’t boxed into a corner because inflation is still below the target, it is slightly easing off the brakes. PreviousAre Americans In Good Financial Shape?